There’s a lollipop explosion on the plate – as bright as the Venice Beach, California, street art on bare brick walls – at Dos Bandidos’ second location in downtown Tulsa. 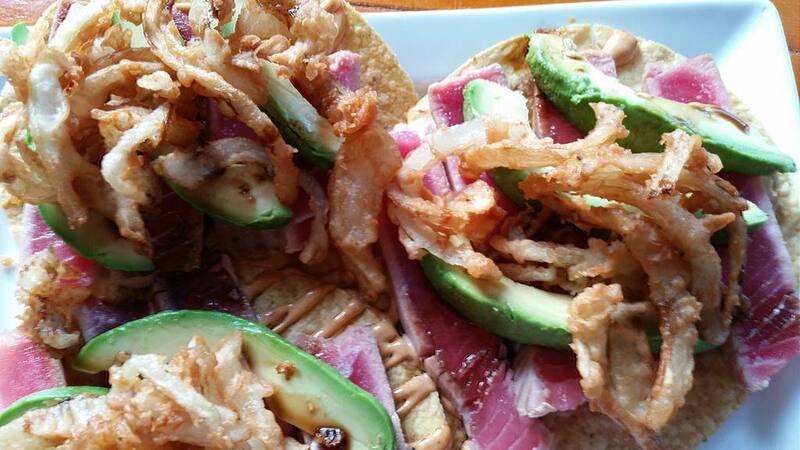 Gleaming pink tuna, fresh and clean, blends with pale green avocado on the beige tostada. Lopez picked up most of the dishes while traveling around Mexico. He’d visit a friend’s house in Sinaloa or Jalisco, the friend’s mother would cook him a meal, and he would watch her before snagging the recipe. Then there’s the spaghetti (yes, a traditional Mexican dish). When Lopez (born in Venezuela but raised in Tulsa) went to Jenks High School, this was his best friend’s favorite meal. He got the recipe from the friend’s grandmother, who hailed from Veracruz. But it won’t be ready for another hour or two. Poblano peppers have to be roasted, a complex cream sauce has to be made, and Lopez insists on making it fresh every evening. So have some of the enchiladas – rich, cheesy and fabulous – and, if you’re lucky, Lopez will let you try a new dish he’s working on: a taco, its filling crunchy, sour-sweet and meaty. But there’s no meat. It’s filled with purple, stir-fried, hibiscus flowers. 109 N. Detroit Ave., Tulsa; 13330 S. Memorial Drive, Bixby; facebook.com/DosBandidosBixby.